The Polymath Chronicles: Winners Announced and A guest post with giveaway! Angie...we are SAVING THE SAUCE! Tracy McCarty...No more employee gift spatulas for you! LeslieJane...you and your Suitor can each have your own spatula and still have one to spare! You have to pick your size/color combos! Each of you is getting one Ultimate, one Skinny, and one Mini. Please send me an email at staceyballisinfo (at) gmail (dot) com with your shipping address and which colors you want for your sets. Your options are white, black, gray, pink, magenta, yellow, orange, red, sky blue, lavender, teal or lime. You can have all one color or mix and match, just be sure to put the details in your email and congrats! For those of you who didn't win, I still cannot recommend them enough, they are worth the purchase, and you can buy yours HERE. Since I adore you all, and want everyone to have a shot at something wonderful...I've got another giveaway! 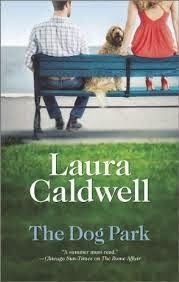 My dear friend Laura Caldwell has written an adorable new book called The Dog Park. And since it is summer, I know that many of you want to take your pooches with you for some al fresco dining. As I do not myself have a dog, I thought this would be a great opportunity for Laura to share some of her tips, and as a bonus, she has THREE SIGNED COPIES to giveaway! Just comment below by 11:59 pm CST on Monday August 4 to enter. - Do ask any restaurant with outdoor seating if you can dine al fresco with el doggo. Unless the outdoor area is a partially enclosed patio, most establishments are happy to have you. - Don't let your pup roam. The couple who smiled at him across the deck doesn't want him sniffing their newly-delivered burgers. - Do ask your server for a bowl of water for your dog. - Do bring treats or a tupperware of Fido's own food. (Everyone sees the strip of chicken that goes under your table and onto your pup's head before landing on the floor for him to eat). - Do bring your dog everywhere while it's still seasonable out! -Don't be afraid to dine just you and the pup...just bring your copy of The Dog Park to read while you both are enjoying a beautiful day! Please feel free to find me on Twitter and Facebook. Good luck! Thanks Laura for these tips! Now everyone start sharing in the comments so you can be entered to win a signed copy of this terrific summer read. The Dog Park sounds like a great read. I would love to win a copy. I do this -- and more. Sounds like the perfect book for me! Book sounds great! Would love to win a copy. What an interesting concept for a book! As a dog lover... I can relate. I love my fur beast... He's the only child I intend on having! I love to dine al fresco and bonus with my dog. I can't wait to read this . Haven't seen this book, putting it on my to-read list! I'm looking forward to reading her book. ~Liz L.